A spate of injuries last year contributed to the club’s relegation from Division One of the County Championship and a winless 50-over campaign. The new team at the helm of the county, with Mark Davis as head coach and Luke Wright as captain, have worked their squad into the ground over the winter in order to ensure the same thing doesn’t hamper them again. There appears to be a consensus at the top of the club that the team that ended 2015 under Mark Robinson weren’t as fit as they could have been, and thus the distinguishing feature of the new regime has been its rigorous approach to training. A spot of winter sun sounds like the perfect tonic, but an intensive pre-season camp in south-east Spain allowed Davis to begin an overhaul of the team’s entire approach to physical preparation. “We’ve put a big thing on fitness pre-season,” Davis said. “Injuries were tough last year, they hit us at horrendous times. If we have so many injuries, we need to look at your physicality and make sure we don’t get injured. We’ve put the work in, you can’t put it in during the season- there’s not enough time- you’ve got to do it in pre-season and we’ve done that well. Skipper Wright is already heartened by the progress already made by individuals towards targets set in the aftermath of last season. “When I left in November, we spoke to the guys about the improvements we wanted to make physically and technically to our games,” Wright said. 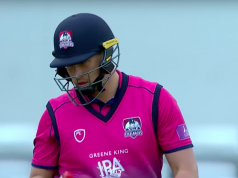 The 31 year old believes that in recent seasons the demands placed on players seeking to break into the Sussex first-team have slackened from when he first emerged as a youngster in 2006. “I think it’s been too easy to get into this side,” Wright said. Wright, who shone for Melbourne Stars in the Big Bash over the winter, sees at his disposal a team who are keen to learn and put right recent setbacks. “In a way, I’m taking on the squad at their most vulnerable, when you’ve just gone down with a lot of young guys not having the results they wanted to personally. I think people take things on a bit easier than when they’re scoring runs and ahead of the game. Under the direction of a new ship’s captain and first mate, the crew are invigorated by the clearing of the decks. 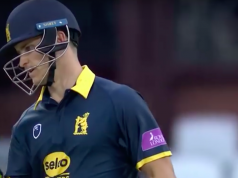 “All the players have loved it, to be honest,” said Ollie Robinson, after a breakthrough season that saw him banish bad memories of his sacking at Yorkshire. Ben Brown is an influential figure in the dressing-room and has been installed as Wright’s vice-captain. “Mark has put a big emphasis on our fitness and our fielding which I think is a really good idea,” Brown said. Wright in particular is keen on viewing the development of this group of players in terms of a three-year plan. Their gruelling physical work is designed to come to fruition in three years’ time in a team that can thrive in the top tier. He emphasised that bouncing back into Division One immediately is not the priority: “When Mark and I sat down at the end of the season we wanted to put a few things in place rather than set goals to win trophies. Although he seems to have been strident in establishing early on his team’s DNA, Davis’ personal style will surely continue to evolve. What sort of coach will be in charge of Sussex this season? “I’m very different to Mark Robinson in many ways,” Davis said. “I’ve had lots of good people to learn from and I’ll take the bits that I like from them and integrate that into my style, but I’ve certainly got my own style. The South African is not intent on making major changes: “First and foremost, we’ve performed well as a club over the last ten years. Perhaps the biggest change at the county will be in the expectation of its team; quickly going from Division One underdogs to Division Two behemoths. Davis is undeterred by the scrutiny on his team, even in light of the sole promotion berth that is available into the top tier of four-day cricket. “The expectation is there and we can’t get away from it,” he said. “We’re obviously a club that’s done particularly well in four-day cricket over the last decade so I guess the pressure’s there.